Candidate for the presidency of the Confederation of African Football, Mr. Ahmad Ahmad on Thursday declared that his group is committed to installing new thinking and ideals at the CAF headquarters, if he wins this month’s poll in Addis Ababa. Ahmad, who is also deputy Senate President of Madagascar, told Nigeria’s Senate President Bukola Saraki, Sports Minister Solomon Dalung and NFF officials in Abuja that African football cannot afford to continue with ancient principles while the rest of the world’s game has been taken over by youthful, dynamic and innovative managers. “The rest of the world has changed in almost every sphere. Why must African football remain static? We want to bring a breath of fresh air. We are committed to a CAF that is transparent, that is accountable and that is more inclusive of the actors of the game. The 57 –year old insisted he had not always nursed an ambition to be CAF President, but that he was the candidate of a group that came together after the FIFA Congress in Mexico last year and opted for change. “There are many reasons why we need change. Presently, too much power is concentrated in the CAF Executive Committee, and we feel that should not be so. There is no separation of powers, and certain individuals feel they should take all the decisions while others applaud. “At the same time, CAF is too far from its affiliate Member Associations. The CAF President should travel more often to the Federations and help nip in the bud the usual tensions that exist between government and the Federations. 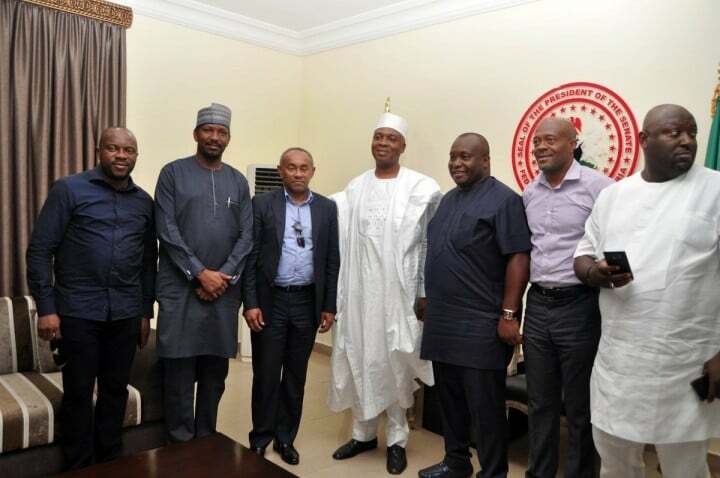 Senate President Saraki, who received Ahmad and the NFF delegation led by 2nd Vice President/LMC chairman Shehu Dikko in his house, noted: “We are a nation of very passionate football fans. Football, like other areas of life, needs visionary leaders who can institute reforms for good governance. 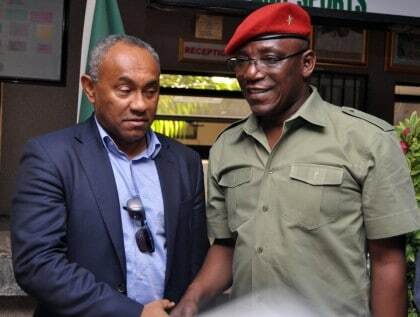 Sports Minister Dalung affirmed that football is a major unifying factor in Nigeria, a multi-cultural country of over 250 ethnic nationalities and about 170 million people. “Our country has made, and is still making major contributions to peace and security in several African nations, and has also been making positive contributions in the game of football. Over 70 per cent of Africa’s youth are unemployed, and we believe that with good governance and excellent management of resources, football can provide employment for hundreds of millions of Africa’s young population and by so doing, reduce social vices and restiveness. “The barriers against Africa competing favourably in the international sphere must be broken. There are a lot of impediments, including poor infrastructure. FIFA should allot more money to Africa for infrastructural development, and there must be equity. “We cannot afford to remain a mere plucking ground for the European Leagues. The leaders of African football must address these salient issues”. 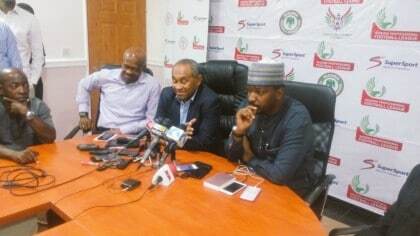 With Ahmad were Dikko, Dr. Mohammed Sanusi (NFF General Secretary), Dr. Ifeanyi Ubah (proprietor of FC IfeanyiUbah and Chairman of Anambra State FA), Dr. Emmanuel Ikpeme (NFF Deputy General Secretary), Mr. Ademola Olajire (NFF Director of Communications) and Mr. Chikelue Iloenyosi (special assistant to NFF President). Ahmad was first received by the NFF Management at the Glass House, and later visited the office of the League Management Company, where he addressed media representatives, before flying out of Nigeria on Thursday night. He had arrived in Lagos earlier on Thursday where he was received by NFF President Amaju Pinnick and 1st Vice President Seyi Akinwunmi, before proceeding to Abuja.